I simply could not be more excited to share this gorgeously modern preppy bridal shoot from Kat Harris Photography and The White Dress by the Shore! 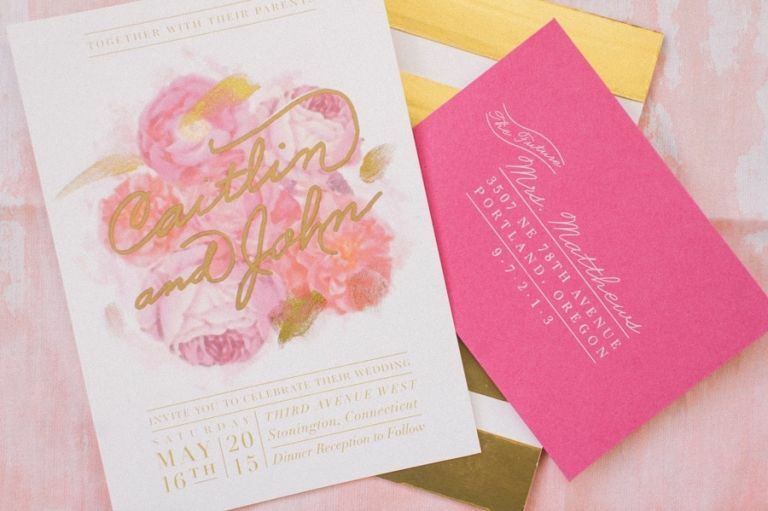 Every detail – from the pink and gold floral print wedding dress to the striped bridesmaid dresses, the colorful floral design to the watercolor details – speaks to Hey Wedding Lady’s fun and fabulous aesthetic! It just doesn’t get any better than that incredible floral print Kate McDonald wedding dress – the A-line dress in a splashy watercolor palette of pink, fuchsia, and gold with hints of aqua inspired the shoot’s palette. Colorful rose and peony bouquets in sunset hues of coral and pink from Hana Floral Design captured the beautifully chic colors of the gown. Gold glitter shoes by Kate Spade and a playful aqua clutch picked up the accent colors in the print to create a beautifully rounded look. Stylist extraordinaire Beth of The White Dress by the Shore paired the bride’s gown with bridesmaids in adorably preppy white and gold striped dresses from LulaKate. 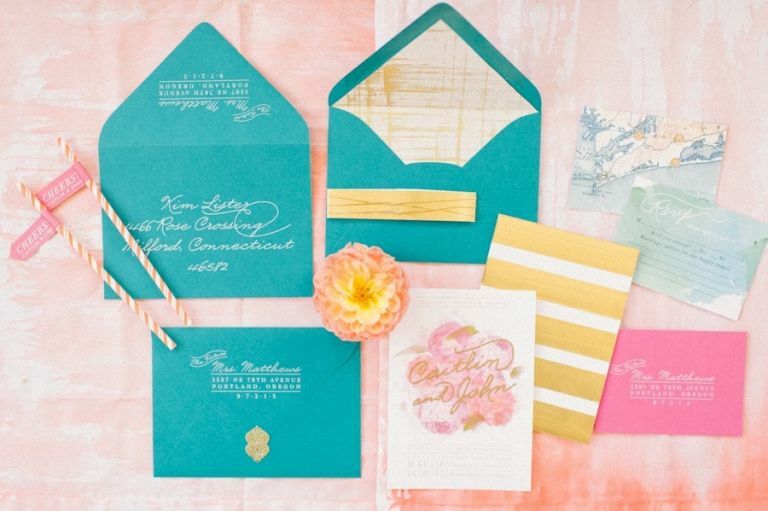 The splashy palette continued across each and every detail in the shoot – Tie the Binds Weddings created a gorgeous stationery suite that incorporated gold calligraphy and a pink peony print to invite guests to the wedding, and a modern watercolor pattern for everything from menus to programs to custom signage. The table was set with bright and cheerful flowers, inviting guests carrying gold foil place cards to find their seat. Watercolor table numbers and swirling marbled plates lent a beautiful artistic touch to each place setting, accented with an ombre watercolor napkin!